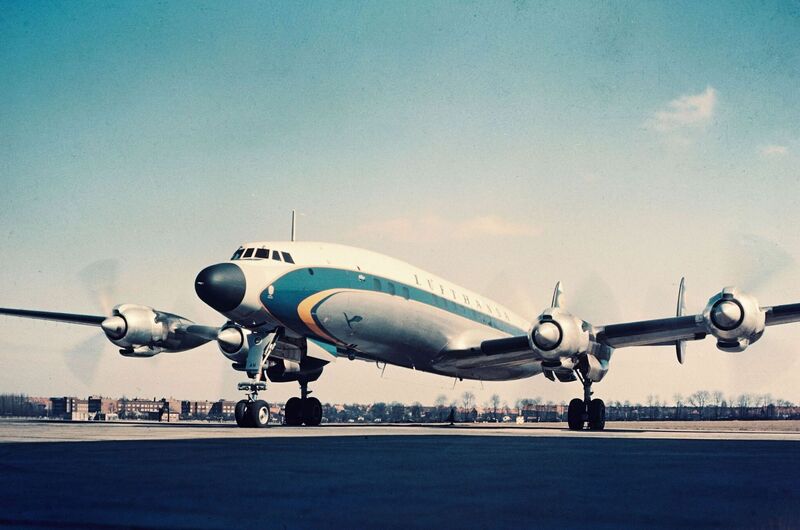 Lufthansa is celebrating the 60th anniversary of its Senator Service onboard the Lockheed Super Constellation, which represented the first “luxury” transatlantic flight in 1958. This weekend, you can experience that service yourself. If you’re in New York City this weekend, consider swinging by Duarte Square (6th Avenue and Grand Street in SoHo) on Sunday (14 October) between 11:00 A.M. and 5:00 P.M. There, you can partake in an augmented reality experience that promises to relive the golden age of travel, with crew dressed in vintage uniforms and passengers dressed in black tie attire. The event if free of charge. This “Fly Through Time” exhibit underscores an even more ambitious project Lufthansa is undertaking to restore at least one of its Super Constellations to a point of airworthiness. While the project has been ongoing for 10 years, Lufthansa has “reclaimed” one of its old aircraft and transported it back to Germany. The aircraft currently sits in Hamburg. Originally, restoration of four ex-Lufthansa Constellations was attempted in the USA, but the project encountered funding and parts problems. In Switzerland, a restored Constellation has been flying for years and will resume offering passenger flights next year. While beautifully restored on the outside, that aircraft has new engines and advanced GPS and anti-collision technology. Lufthansa originally tried to restore the 1950’s engine on its Super Constellation but will need to re-engineer the mechanical section of the plane in order to make it airworthy. LH has in fact abondoned its attempt to restore the L-1649 for flight. The nature of the move from Maine to Germany for the aircraft and the way they are handling all the paperwork is essentially rendering the aircraft unairworthy permanently. It’s a shame given how much had already been spent and how far they had come that they decided not to finish the task they had embarked upon. To see a Starliner take to the air once again would have been epic. That’s very sad to hear. From what I read, I thought LH was trying to restore one of the four and fly it again, just like its old Junkers-52. Did you see the link in my story to the Swiss Connie that is still running?